People can choose to put themselves into positive circles or negative circles. Each approach has consequences. Let’s explore these two approaches. 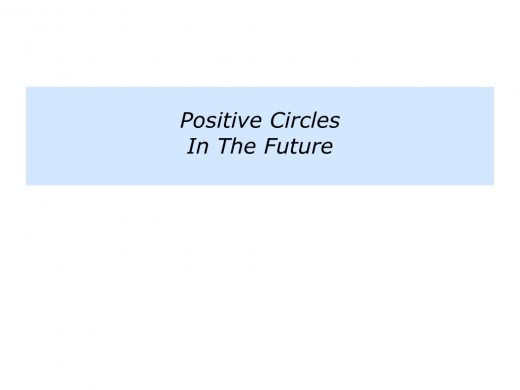 Looking back, can you think of a time when you put yourself into a positive circle? You may have experienced a setback, for example, but chose to have a positive attitude. Translating this into positive actions, you then experienced positive achievements. These could have taken the form of feeling better, getting a success and gaining strength to continue shaping your future. Many people know the things they can do to increase their chances of feeling positive. Sometimes they follow these habits and find fulfilment. Sometimes they forget and feel frustrated. Then it is time to re-take charge of their lives. One person wrote that she aimed to take these steps by doing the following things. To get enough sleep and eat healthy food. To do exercise I like, such as walking. To spend time with people who encourage me. To do stimulating projects at work. To return to singing and create a website of my songs. Looking at this list, she rated the probability of her doing these things. At first it was 7/10. How could she increase the rating? She loved planning, which was part of her job, but often did it for other people. This time she focused on her own life and mapped out the next three months. She began populating the schedule with activities that would help her to feel positive. These became the first things she put in her diary. Then she added the work and other activities. Looking ahead, she explored how to get some successes. This led to making detailed plans for the next week. She wanted to move quickly and develop good habits. Completing the planning, she revisited her original rating. Feeling determined, she believed there was now a 9/10 probability of carrying out the action plans. She already felt the momentum carrying her forwards. 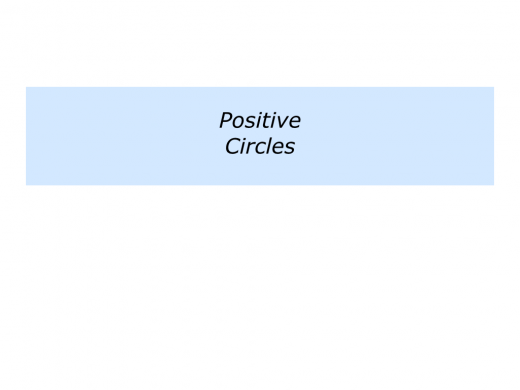 Imagine that you want to put yourself into positive circles. How could you make this happen? One approach is to do the things that give you positive energy in your personal and professional life. It is then to keep following these steps so that they become habits. You will, of course, do this in your own way. If you wish, try tackling the exercise on this theme. 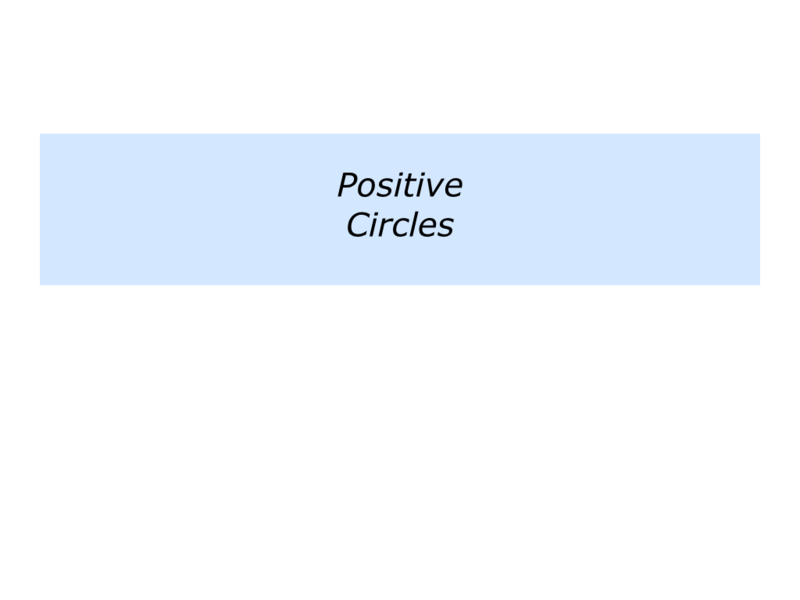 This invites you to describe the specific things you can do to put yourself into positive circles. People can sometimes put themselves into negative circles. One person explained how they did this at one point in their life. “I did this during my late twenties. At the time I was in a relationship that wasn’t working, but neither of us had the guts to end it. “I had got into bad habits, eating junk food and smoking. Work wasn’t much better. Even though I was in a go-ahead industry, I had lapsed into doing routine stuff. My main solace was listening to music on my headphones, both at work and at home. “The wake up call came from home. My mother fell ill and I spent lots of time taking care of practical things for her and my father. “This got me thinking about what I wanted to do in my life. Even though I wasn’t yet thirty, it felt like I was middle-aged. “So I decided to get my act together. I began by ending the long-term relationship that wasn’t working. This came as a relief to both of us. “The next thing was that I began cycling. I have always been adrenalin-driven. But, if I don’t have a goal to go for, I get lazy. So I began doing sponsored bike rides and raising money for charity. Plus I got back into mountain biking. 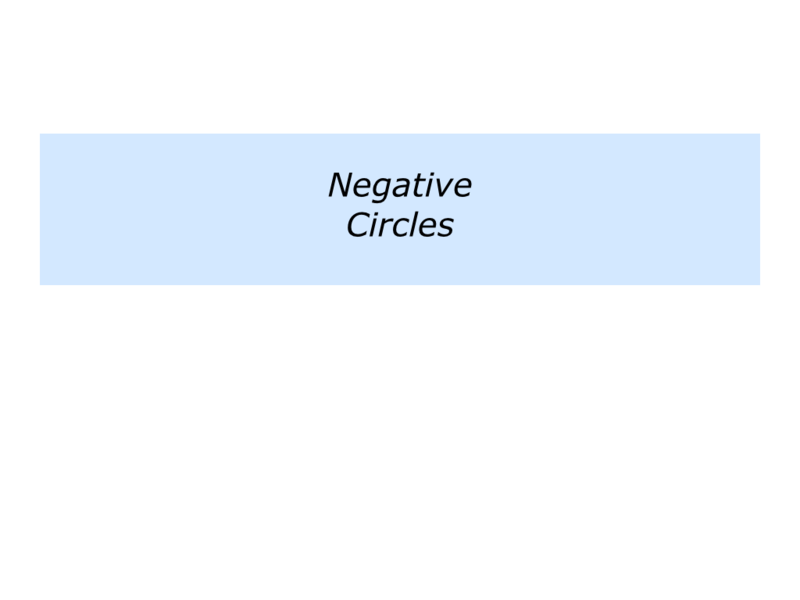 Different people can put themselves into different kinds of negative circles. They may not feel good when getting up, listen to negative news on the radio, feel stuck in an office where they hear people moaning, work with unmotivated people, eat poor food, do boring jobs, return home exhausted, fail to encourage their partner, watch more bad news on the television, go to bed and repeat the pattern the next day. Looking at your own life, is there any time that you find yourself getting into negative circles? If so, what are the consequences? What are the specific things you know you can do to get out of the negative cycle? 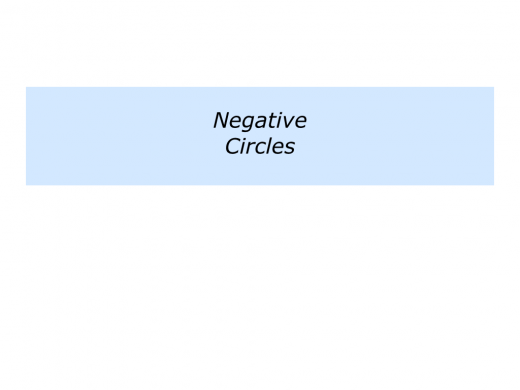 Describe the specific things you may sometimes do to put yourself into negative circles. 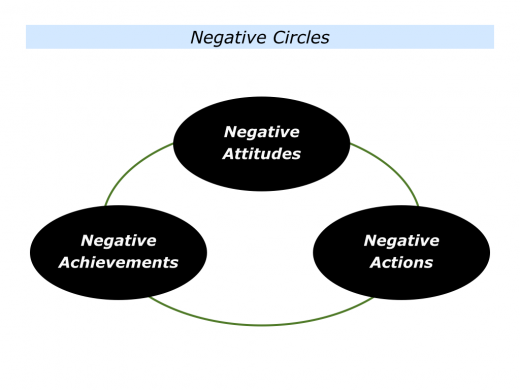 Describe the specific things you know you can do to get yourself out of negative circles. Looking ahead, how can you maintain the habit of putting yourself into positive circles? Different people give different answers to this question. Here is a collection of the answers that individuals give. Walking our children to school two days a week … Getting off the tube two stops early and walking through the park to work … Focusing on the things I want to do that day … Organising my time in blocks … Getting an early success . Going to visit my favourite customers … Going home at a reasonable time … Enjoying time with our children … Relaxing with my partner … Remembering what I am grateful for … Looking forward to the next day. Many people know the things they can do to feel positive. But what if they find themselves slipping into negative cycles? One approach is to learn from people in sports. They sometimes do the following things. They recognise the warning signs. The signs are different with each person, but in some cases they take the form of negative self-talk. They have a personal ritual for switching back into positive mode. One athlete, for example, physically puts his hand to his head and throws away the negative thoughts. But each person chooses a different ritual. They do something simple to get a quick success. They do something to build confidence. They get back to basics, follow good habits and get a quick win. This gives them the platform for delivering future success. If you wish, try tackling the exercise on continuing to do positive things. This invites you to do the following things. 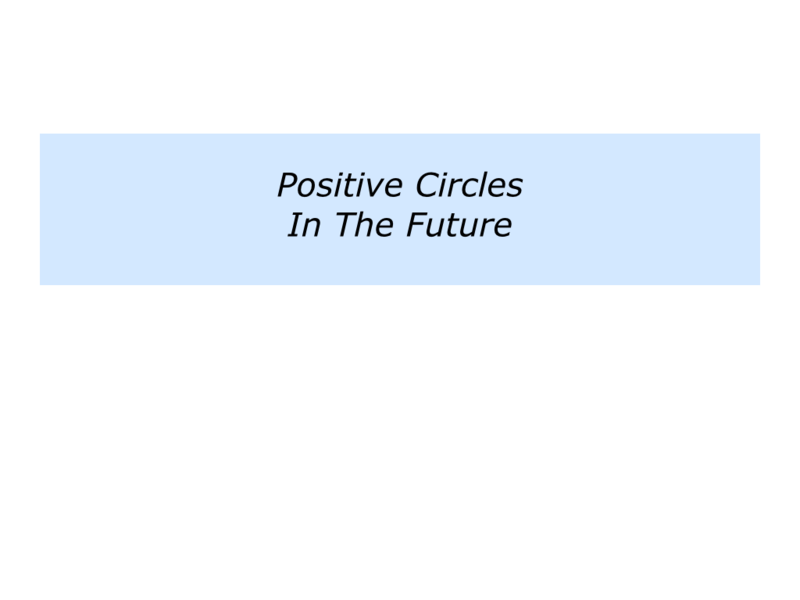 Describe the specific things you can do to continue putting yourself into positive circles in the future. 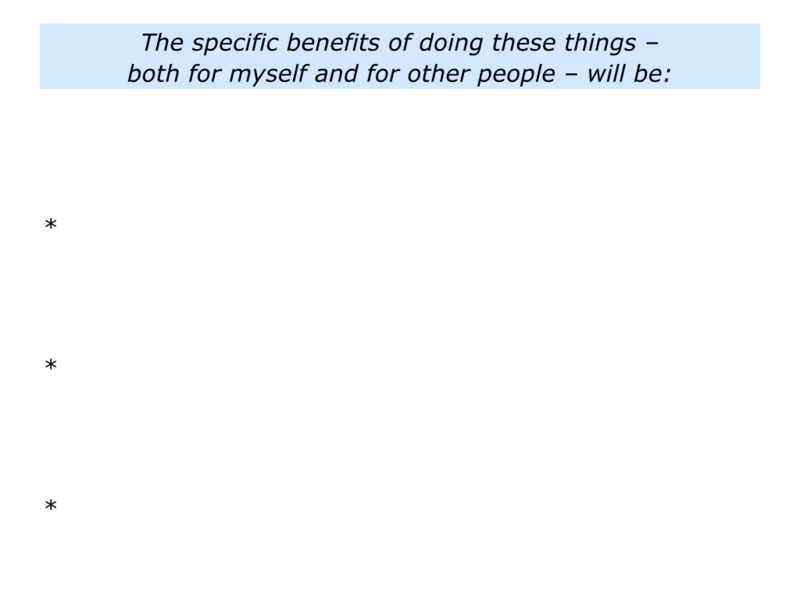 Describe the benefits of doing these things – both for yourself and for other people.